NOJuju: Hansen's Sno-Bliz 2010: Four New Flavors! WOOO! 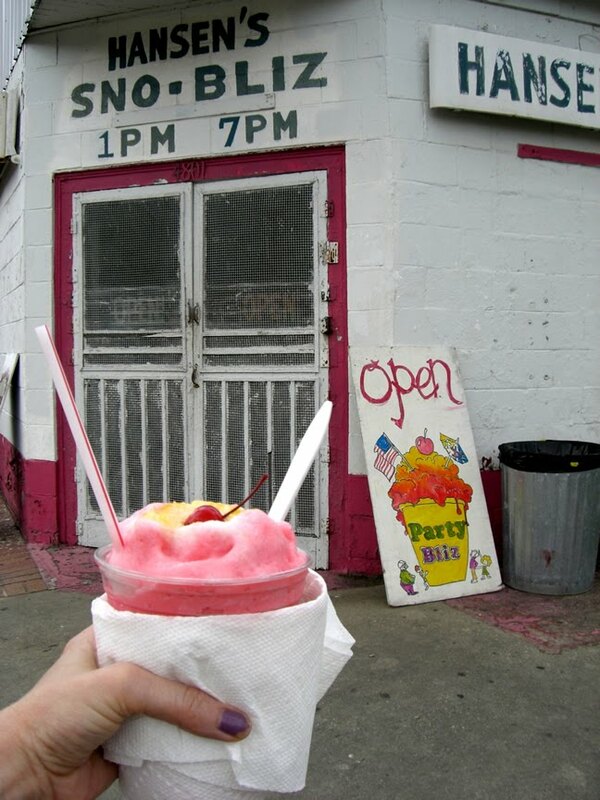 Hansen's Sno-Bliz opened today for the 2010 season! Hooray! I hustled down fast to get my favorite Nectar Cream Sundae (I've been craving since last summer) and because I was so quick on the draw, I only had to stand in line behind one person! I'm the luckiest. What's more, Ashley Hansen gave me the scoop on four new, all natural flavors she is bringing out this year and gave me a sneak peek taste test. The flavors are Vanilla Bean, Raspberry, Gingersnap and Cardamom. I tasted the Raspberry (delightful) and the Cardamom. When she first told me Cardamom, it was so unexpected that I didn't even recognize the word and had to ask her to repeat it a few times. Me: "OH, YOU MEAN CARDAMOM?!?" Yeah, I know. I'm an idiot. Anyway, cardamom does happen to be one of my all time favorite spices so I was thrilled to get a taste and guess what, it tastes exactly like cardamom! Only cold. And sno-blizzy. It's utterly delicious. On my way out, I stopped at McKeown's Books and picked up copies of Simple Cuisine by Jean-Georges Vongerichten, Shark's Fin and Sichuan Pepper by Fuchsia Dunlop and Comfort Me With Apples by Ruth Reichl. Looking forward to some leisurely perusing this evening. Yum! The ice cream stands and A&W Drive Thrus are just starting to open up here for the season. That's how you know it's really spring. Cardamom and gingersnap sound really interesting. Dang it! Wish I had been able to go with you. They are the best in town.